SAN FRANCISCO – 4/22. Made x Devil’s Pie … Come to Otis for Made’s Anniversary Party. Sweet treats and sweet beats. BE THERE! SACRAMENTO – 4/23. 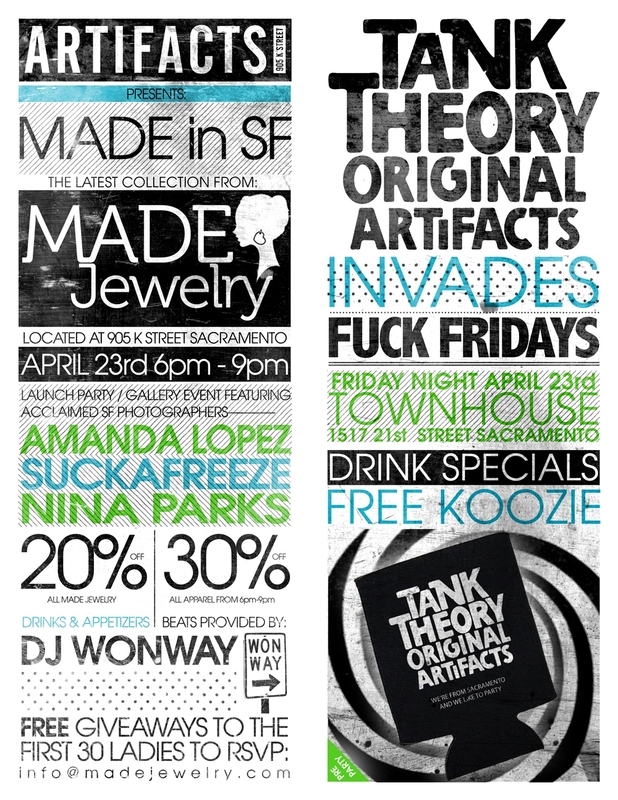 MADE in SF Release Party and Gallery Event: Get a sneak peek of our latest collection before the official release on 4/27. We’re teaming up with Artifacts (a lifestyle and urban boutique) in Sacramento for the official release. It’s gonna be a big event with a DJ, food, and booze! It’s also doubling up as a gallery event showcasing photos from 3 popular SF photographers. SAN DIEGO – 4/24. 4 pm in store event at Mimi and Red, organized with the help of Mahfia. This event will be very similar to the Sacramento event, and Sam will be spinning. Come one, come all! Then after, head to On Broadway for the MAV foundation Charity Fashion Show and holla at Made, all for a good cause. The party stops at Confidential for the official afterparty!